This past week bounced back and forth between rain and rain showers. 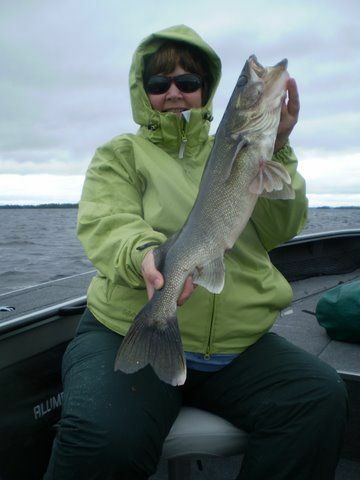 We had May, July, and Sept. weather days and the result was rapid movement of walleyes out on to Main lake summer sand structure. We had another 3.5 inches of rain this week and more is forecasted on the way. 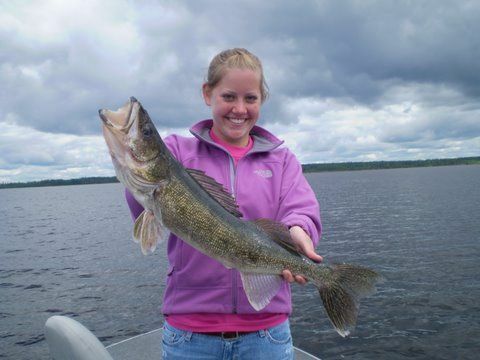 The weed beds are just beginning to top out in some areas, but the walleyes have simply pushed right on past the weeds and headed to deeper water fast. They may pulse back if we get a consistent hot spell, but so far that just hasn’t happened this year. 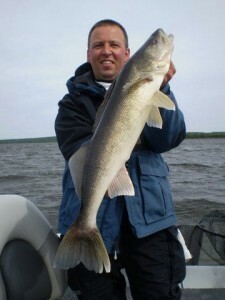 We checked often, but there was very little shallow water walleye activity. We have seen the first few mayflies beginning to hatch, but I feel that they will have very little impact on the walleye bite this year. We didn’t need any more rain, but we are getting it anyway. I have about 3-4 more inches before the ends of our fixed docks go under water and there is quite a bit of bank erosion occurring on many of the main lake sand bluffs. The water depth increase has actually been enough to change the relative level of success on many of our consistent summer spots. Some recent hot spots from the past few years have cooled off and some classic favorites are back on again. 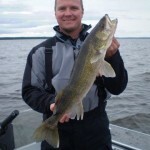 There were a few walleyes caught on main lake rock, but the sand structures were by far the most productive. Key depth zones changed with the weather, but 20 – 32 ft. seemed to support the most activity. We ran bouncers and spinners with some success, but 90% of the production was on 1/4 – 3/8 oz. jigs with minnows. 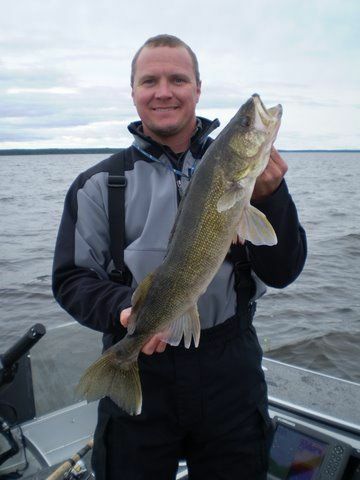 Walleye volume was fairly consistent and guide sheets averaged 35 walleyes over 18in. per boat per day. The highest daily total was 72. 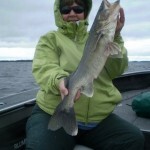 The big fish were off this week. 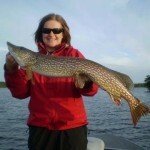 We worked hard to find them, but the inconsistent weather resulted in quite a bit of lock jaw for the bigger girls. There were many times that we were moving slow enough to be able to watch fish on our electronics swim 8 – 10 ft. off the bottom to look at our jigs and then just swim back down. Finding fish is usually the biggest challenge, but this week, it was trying to figure out how to get them to bite. Or more precisely, the trick was to make sure that you got back to the spot when the fish were just a little bit more aggressive. 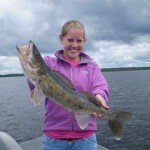 For the week we had 24 walleyes over 27 in., including 4 – 28s. The bass bite is beginning to taper off a little. We still had a good top water bite going during flat calm conditions. For the week, we had 44 Smallmouth over 17 in., including 12- 18s, and 1 – 19. Last year the end of the mayfly hatch was the event that marked the end of the bass season on our end of the lake and I am guessing that we will see that happen within the next 10 days. 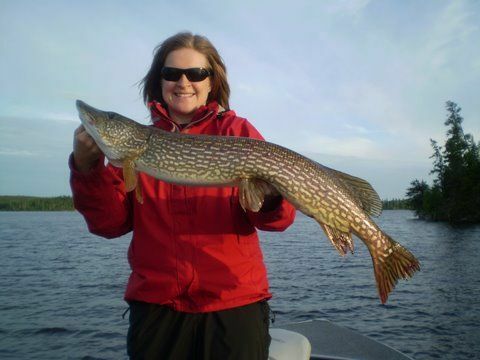 Pike were random at best this week, there was almost no effort made to chase them, and we didn’t catch any big ones.